We quickly voted Seattle the friendliest city in all of the United States! Hospitality ran high – in our week here we had 4 dinner invites from complete strangers! Thanks to Don & Debbie Prescott, Tom & Jan Hunter (another Pan-Americaner) and the Gold Wing crowd – Phil, Scott & Lynette. In this time ‘Ride West BMW’ proved they were the best dealer on the continent with a superb level of service, customer care and attention. They squeezed us into their busy schedule, did an excellent job replacing the head bearings and were kind when it came to the bill, charging minimal labour costs. We did all the touristy things in Seattle – rode the elevator up to the top of the Space Needle for its spectacular views of the city and snow clad Mount Ranier, mooched around Pike Place Market, saw the original Starbucks jam packed wall-to-wall with tourists paying ridiculous amounts of money for mediocre coffee and crappy souvenirs. Our time in Seattle ran out all too soon and on a grey Sunday morning we set out towards the Olympic Mountains on a scenic ride to Port Angeles. From here we took the afternoon ferry across to Victoria on Vancouver Island. We had little idea of what lay ahead on Vancouver Island only that just about every Canadian we met told us we had to go there. Then Kathy Campbell, who we’d met in Costa Rica, where she’d been backpacking with her daughter Jess, sent us an invite to come stay with them on the island. Our dusk arrival into Victoria saw the MV Coho glide silently into one of the most beautiful little harbours on the planet. Set against the splendid backdrop of the Parliament Building and the monster chateauesque Empress Hotel, all fronted by a delightful tree lined promenade, the city affected the calm charm of a Riviere resort. We rode along the promenade and through the small downtown area immediately falling in love with this the most beautiful city we’ve seen to date in all of North America. During the trip we have visited countless North American towns and cities and to be honest most manage fairly well to be dull, characterless, soulless places. In fact I came up with an acronym – JANAM – Just Another North American Metropolis that could be used to describe places like Phoenix, Spokane, Calgary, Prince George, Anchorage – in fact nearly any major North American conurbation. Big sprawling places full of strip malls and retail parks that could be anywhere. They all look like they were formed by pressing from a giant jelly mould that stamped out regular blocks of condos and shopping malls (all containing the same identical shops – Starbucks, Walgreens, Subway, etc) around a high rise central business district with nightmare traffic. But not Victoria – at least not it’s downtown and harbour districts – that oozed with character and life. We stayed here for 3 nights and had a most relaxing chilled visit spending our few days idly strolling the lazy streets and soaking in the atmosphere. We visited the spectacular BC Museum with its huge collection of Native artefacts and at the Irish Times Pub we had the best Pint of Guinness and Irish Stew outside home (they also had live music every night). We left our idyllic haven in a heavy rain shower and rode up the coast to Merville to stay with Kathy and her husband Jerry – another motorcyclist with his immaculate CB900F. Kathy & Jerry have both travelled a lot and they really went out of their way to make the last days of our trip special. We arrived mid-afternoon at their fairytale cottage and an aroma of home baked cookies made just for our coming! At Merville we languished in good company and totally chilled out. Very soon we would be immersed in all the rigmarole associated with winding the trip up and getting the bikes and ourselves shipped home. But we could put that off a while longer and relish some more of this good food and sip the odd glass of wine with good friends. We took a ride out with Jerry across the island on a twisty mountain road to Gold River taking full opportunity of the glorious weather afforded by an Indian Summer on Vancouver Island. Our final stop followed another ride across the island to it’s ocean side at Port Renfrew, where we had use of Kathy & Jerry’s holiday home. If we thought we’d been relaxed at Victoria and Merville then our stay at the ‘Renfrew Ritz’ took the notion of ‘chilling out’ to whole new levels. We spent a day walking and beachcombing at Botanical Beach and another canoeing up the San Juan River. We saw Bald Eagles, a family of four Sea Otters and a flight of Pelicans who we hadn’t expected to see this far north. We really could have stayed here forever! But, the trip was now sadly coming to an end. We took the ferry all too soon back to the mainland and headed for Vancouver. We did investigate shipping the bikes back from Seattle but since 9/11 US Customs procedures are a nightmare and it is cheaper and a lot more straightforward to ship from Canada. Rather than stay in the metropolis we found an idyllic little seaside town called Steveston, on the coast near Richmond BC, and made it our base whilst we organised the end of the trip. A morning on the phone to prospective shippers getting quotes. A trip to the library to check flight details on the Internet. I spoke to a delightful wee diamond of a woman from Glasgow called Maggie Mathieson, who assists her husband Jim in operating the Vancouver branch of a freight forwarder called Sea-Air International. They normally ship livestock and animals – everything from horses to dolphins but had some experience with shipping vehicles and personal effects. Jim asked us to leave it with him and in 24 hours had located two bike crates for us along with a very reasonable quote for the shipping. We spent a day at Pacific Yamaha & BMW crating the bikes – horseshoeing them into a pair of Yamaha crates. A big thanks to Nick, Yanni and Jacob there for making this operation easy and smooth. My bike had to have its front wheel removed – the front end was then set into an axle clamp (in an R6 crate) locking the bike into the crate floor. Mags bike was crated with its wheels on (it was a crate from a Drag Star) but her clocks stuck up through the top of the crate and so had to be removed. 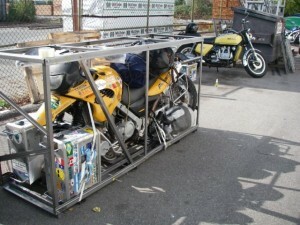 We removed the handlebars too from both bikes, strapping them to the top frame of each crate. All of our luggage was then fitted around the bikes and a cardboard cover applied and that was that. A week by train to Montreal followed by two weeks to London by sea. We had dreaded this part of the trip – the logistics and costs of shipping it all home but in the end it proved to be relatively easy and inexpensive. We also found one way flights to Gatwick with Air Transat, a charter airline, for $189 CDN (2.2 to the £) and that was that! So that was our Pan-American Adventure. Chile to Alaska. 35,500 miles in 15 months on the road spread over the 3-year period. What was it like? Quite simply, it was the best thing either of us has ever done in our entire lives. What were the best bits? Setting aside routine to live life against a constantly changing backdrop, never knowing what comes next or what lies up the road. Meeting new people everyday and seeing new, strange and exotic places. Sampling weird and wonderful foods and drinks. Riding our motorcycle in almost perpetual good weather with all you need for an uncluttered uncomplicated life, all there in your saddlebags. Argentina was by far the best place we have ever travelled. Our 2-week trip there turned to a 3-month stay and could have easily been longer. Torres Del Paine (Chile) – most beautiful place on Earth (so far! ), Iguazú Falls, Galapagos Islands, Guatemala, Roatan, Sequoia, Yosemite, Crater Lake & Glacier National Parks – all areas of stupefying beauty. And then there was Alaska – the place that more than any other left its mark on us. What were the lows? The worst times were when we had bad news from home. In Mexico we learned that my mother was critically ill and had to come home. Our life changed instantly from the ultimate high to a horrific low as we dealt once again with the effects of cancer on our family and loved ones. On the road there were one or two scary moments – Maggie’s crash in Patagonia, breaking her elbow, the crooked cops near Iguazú in Argentina, the infamous Bridge at Ilaves in Peru (where the locals murdered their mayor) but to be honest in hindsight these incidents were also some of the best adventures on the trip as they spiced things up with danger and excitement. Leaving Latin America was sad too as we realised that by comparison, North America would be a doddle. How did the bikes hold out? The bikes were fantastic! We did have one or two niggles the worst being their reluctance to start at high altitude / cold temperatures that affected us up on the Altiplano in South America. We had a fuel pump failure, a blown fork gasket and, by the end of it all, knackered steering head bearings (all on my bike!). We used 4 sets of tyres and replaced the chain & sprockets on each bike once. We also had a few spills and scrapes that have left their mark on each bike. But 70mpg, comfortable riding position and relatively light weight made the bikes a pleasure to ride on the road. How much did it cost? This is difficult to answer – we spent a redundancy package and all the income from rent on our house in England plus some savings over the course of the trip. I really can’t and am not interested in quantifying this with a more exact figure. You can never look at a trip like this merely as something that cost X amount of pounds, pesos or dollars. If the trip was an investment, we personally got a heck of a lot more out of it than what we put in. If you are reading this pondering a similar trip – don’t think about costs too much. Setting your priorities in life is far more important – if you really want to do it make it a priority and somehow, someway you will find the money and the means to achieve it. Would you do it again? At the drop of a hat! To re-iterate – quite simply, it was the best thing either of us has ever done in our entire lives. Within days of returning home we’ve been pondering atlases and maps and been browsing Horizons Unlimited to see what’s next!